Why should you choose an Iron Door? Your front door is the portal; the main entryway into your house. It is the first thing your visitors will see before they enter. This is the reason why your door needs to make a strong impression to visitors: both the welcome variety (who are made up of friends and relatives) and the non-welcome variety (who may want to enter your house with illegal or criminal intent). Your front door, (along with your gate if you have one) is your first line of defense against intruders, as well as the “face” of your home. For these reasons, careful consideration must be given not only to the overall design of your front door, but the material that you will use for it as well. 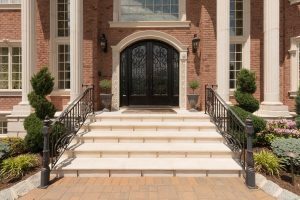 One of the best materials to use for your front door is iron, as it provides several advantages over other materials such as wood or fiberglass. Wrought iron doors are intimidating to say the least. The sight of a huge, imposing iron door should be enough to turn away even the hardiest of burglars. An iron door gives you exceptional security even when coupled with glass (which iron can safely support): using frosted glass will give you adequate privacy to keep peering eyes from looking in, while using transparent glass allows you to see exactly who is in front of your door. The door’s appearance can be tailored to allow for small slits or grills of simple or elaborate design. Wrought iron doors can add some style to your house and; as stated in a previous blog post, can increase its curb appeal. Elaborately-designed iron doors are sure to make an elegant and powerful statement to visitors, guests, and neighbors. Not only that, but these doors can increase the overall value of your property. Iron doors have the obvious advantage of strength. Wrought iron doors are extremely durable, and with the proper care and maintenance can last a lifetime. Wood can rot, Steel may separate, fiberglass can crack, but iron can stand extreme weathering with very little upkeep. Cacciola Iron Works can work with you to design and create the perfect one-of-a-kind Wrought-iron door for your home. With over 35 years of experience, we offer superior customer service and exemplary job performance to give you the utmost in customer satisfaction. Call us at 973-595-0854 or send us a fax at 973-595-6712. You may also contact us online for your questions and for more information.